As a shooter you might have watched some videos of other shooters and thought, “man that was fast, I could never do that.” I am here to say you can! With this post I want to discuss goals, but from a different perspective than you might be used too. Whether you are only concerned with CCW, only competition, or both CCW and competition, we should all have realistic goals that each person reading this can work toward and attain. Goals allow you to judge yourself and your improvement against yourself and not just other shooters; this is a good thing. Anyone that has listened to Dave Ramsey discuss his baby steps to get out of debt understands the concept. Realistic attainable goals keeps us motivated and excited. If we look at all of our debt at once it can be overwhelming, but if we start small and build momentum we stay focused and the task is less daunting. The same thing applies to weapons training. Someone that just learned to shoot last week should not have the immediate (or only) goal of competing on the same level as Max Michel or responding to a threat like Frank Proctor or Mike Pannone. Those might be your ultimate goals, but temper your enthusiasm with realism; depending on your skill, disposable income, and spare time you might gear there quickly, but it will still take steps and a plan. We should judge ourselves, with in our own skill level, with different baselines that match our goals. For instance, using distance to target as one example, we might have close range skills, medium range skills and long-range precision skills. I will elaborate on my range/skill parameters in a bit, but being fast and accurate at 3 yards does not automatically mean you will be fast an accurate at 25 yards. You might be accurate at 25 yards doing sloooow fire, but that doesn’t equate to being fast at that distance. Remember, everyone can be fast and miss at any distance. In a nutshell, this is how I identify skill set weakness and set goals for practice, and in the future I will post some drills I use at each distance. I try to choose drills, which reinforce skills, that are transferable between my CCW and my USPSA Production gear. The biggest difference between the two is the quickness of the draw from concealment and the need for a more refined sight picture with the shorter CCW weapon. But for this post, the actual drills aren’t important, the methodology is. The concept of tracking and measuring improvement against yourself is the what I hope you take away from this post – the need for realistic goals. I want to clarify something before moving on; I am not implying you need only work one skill set to perfection before moving on, but I do feel it is best to decide what your range practice session will entail and stick to one skill or goal set. 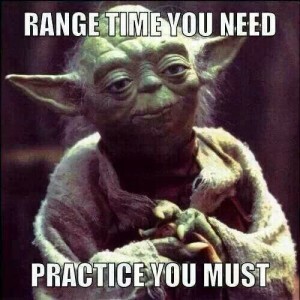 We can all agree that at times a trip to the range is for fun and noise, no practice or excuse needed; but when you set out to actually get better, make sure you are clear on what your range trip is for. I mentioned different distances previously, so let’s break those down now while considering our pistol skills. I believe the close range skill set is for distances of 7 yards or less. Some readers may find this appalling and they may consider that medium or even long-range. I understand! Once upon a time I considered 7 yards medium range, then I got training and shot my first match. Equally, if you say 7 yards is far away, it tells me two things; one, you need to practice more and two, you have never shot a competition – any competition. If you can’t keep slow fire 10 rounds into a 2 inch circle at 7 yards you need to work on fundamentals. That 10 inch group you just shot at 7 yards is pathetic! Quit getting positive reinforcement by comparing your group to other shooters that fling similar sized groups onto the target. Medium range skills, in my world, would be anything between 7 and 25 yards. For those bad at math, 15 yards is forty-five feet; and while that may sound like a long distance, what is the furthest shot you might have to take inside your house? Not just across a bedroom, but maybe out of one bedroom and down the hall into another room. 25-30 feet is possible, isn’t it? Now imagine that shot, in low light, while drowsy, and under stress? Suddenly the 15 yard shot, in broad daylight, while wide awake, and possibly wearing corrective lenses, seems easy. Competition shooting aside, if you can’t slow fire a full magazine’s worth of ammo and keep them on a humanoid silhouette target at 15 yards you are NOT a good shot. The truth hurts, sorry. What about long-range? I view that as anything over 25 yards. The likelihood of needing to make that shot in self-defense is extremely low; but it still exist. With no time limit, can you draw your weapon and put one shot into a 8 inch pie plate at 25 yards? If you have the fundamentals down, your answer should be a resounding yes. If you shoot USPSA you are already familiar with the requirements you must meet to successfully make the 25 yard shot. What about 40 yards? 60 yards? I am not saying you will need to make a 60 yard shot to defend yourself – although you might. I am saying people who can make the 60 yard shot with no time limit have a much greater chance of making that 7 yard shot under stress. Time limits are the one thing I haven’t discussed. I am a big fan of a shot timer (no secret there) and I believe you should use it in all of your training outside of static slow fire sessions. You can use a timer to get some baseline numbers for common drills, and while you could compare the times with your peers or even your hero’s on the internet and YouTube, the real value is when you can go back and compare with yourself on previous runs. It doesn’t matter if you can’t do a certain drill at the same speed as your training hero; it only matters that your times are dropping! Tracking my skill development is why I keep a log book. With the proliferation of smart phones there is literally no reason you can’t open a notes app and write down your times for review later. If you shot some Bill drills, write down the best time and the average time. Alternately, you can use a written log book like I do. There are several available for purchase, but I made up my own in Microsoft Word and put together a binder. The one unspoken benefit of the timer is for when you don’t train for extended periods of time. You can go back and see how much skill you have lost and identify the low hanging fruit. Like Dave Ramsey’s baby steps, setting realistic goals and then achieving them will help you track your improvements, and the realization of improvement is what keeps things interesting. I’m sure I could have many questions, but here are a few I would be interested win hearing your answer to. What do you consider slow fire? How much time are you allowing someone to fire their entire magazine of ammo as you mentioned in the article? How do you think the courts would react to shooting someone in your home if they were 30+ feet away? Slow fire is not timed. You may take as long as you need to get the sight picture you want and pull the trigger. There is no rush. That would seem easy, but a vast number of shooters I have witnessed start pulling the trigger slowly, then jerk it to the rear when they feel the sights are perfect. For a right handed shooter, low and left is your reward; a left handed shooter will get low and right. Example: when shooting slow fire at 15 yards I normally average 3 seconds per shot. At that pace I can keep them all on a 3″x5″ index card. That is a skill I have developed. Your final question has me wondering what State you live in and if your State laws require you to retreat? I live in Texas and we have the Castle Doctrine. We also have a law that protects a person from civil suits if the shooting was deemed self-defense. If someone breaks into my house, while I am home, I have to presume they mean bodily harm. Thus I will respond in like. There are no restrictions on the distance; be it 3 feet or 50 feet, the distance is irrelevant to the court once they enter my home. The only caveat would be if you shot them in the back as they were fleeing. I totally agree with your comments regarding distance. One thing that I would add is that inability to group at distance may be explained in another way. If you can’t keep your shots on an NRA B8 repair center at 25 yards, you may have a fundamentals problem (or a vision one). If you have a fundamentals problem, it may cause issues at various ranges, not just further ones. In addition, pride in pistol craft should result from working to master the fundamentals and moving on to other things and not from ignoring fundamental technique flaws. Many ridicule USPSA as a game, which it is. However, it includes many aspects which are salient across the wide range of pistol activities. One is the balance between speed and accuracy. 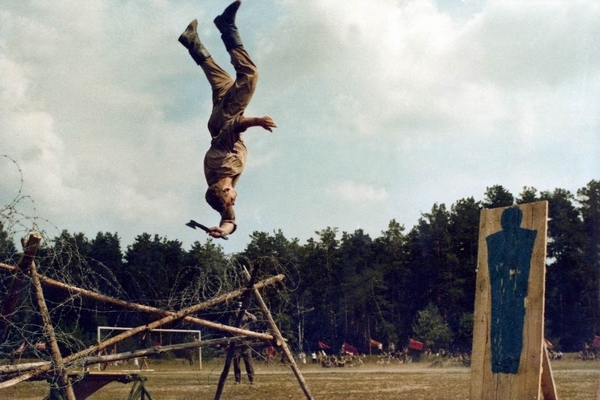 USPSA and IPSC were promoting and rewarding this balance decades before the cool kids started chanting BSA in the new millennium. Distance variation, hostage targets, and hard cover all can affect one’s balance. The points are understanding one’s BSA capabilities, shooting within them, and increasing them. Perfect! Just so you know, I’ll be stealing this!